Overview of inquiry letter: Inquiry letter is a tool of collecting information about people, products and prices. It plays vital role in making decisions relating to employments, purchase and sale of goods. Prospective employers extensively use inquiry letter to collect information about job candidates. In modern time, it is very customary that job applicants mention one or more references in their job application. Prospective employers write inquiry letters to those referees mentioned by the applicants. In addition to employment purpose that want to make credit purchase. Sometimes, inquiry letter is also written to obtain price quotation, catalogue, terms and conditions of sales etc. with the growth and expansion of a business, utility of inquiry letter increases. Thank you for your letter of November 28, 2013. 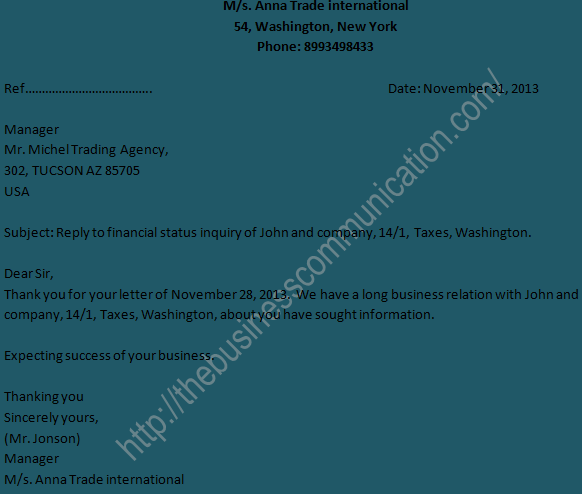 We have a long business relation with John and company, 14/1, Taxes, Washington, about you have sought information. Expecting success of your business.